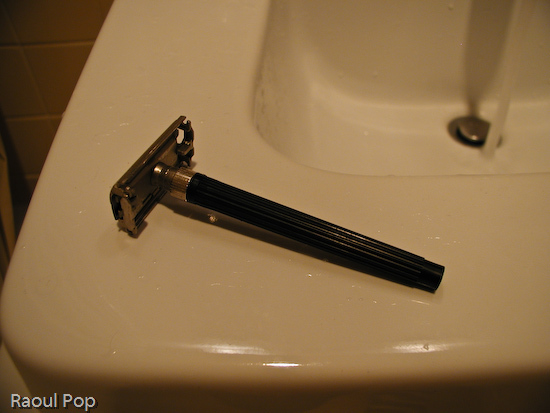 Updated 9/21/12: Since I wrote this article, I also made a video where I go through a typical wet shave with a DE safety razor. You may also enjoy this post, where I talk about how my shaving habits have evolved over time, or this post, where I talk about the current range of shaving products. I’ve wanted to write an article about shaving for some time, but didn’t get around to it until now. In a society where shaving products can be found virtually everywhere, there is a surprising paucity of resources about just how one should shave. I recognize shaving is a very personal and thus, a subjective experience, but someone ought to iterate some useful advice gathered from their experience. For me, I know the advice I give in this article would have been a real gold mine, and would have saved me from needless and countless pain and irritation. I think shaving ought to be an enjoyable experience. After all, most men have to do it about every day, and when you do something that often, it shouldn’t be a source of pain. With these thoughts in mind, let’s proceed. 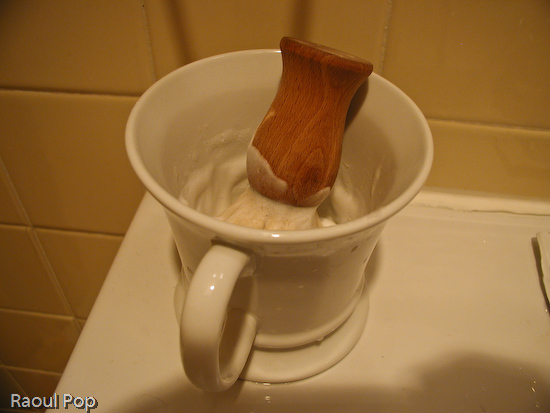 I prefer to use the old-time shaving soap and a shaving mug, but you don’t have to. I enjoy whipping up the lather every morning. It’s my little shaving ritual, and it helps me get ready to shave. If you’re interested, get a good brush, preferably one made of badger hair. 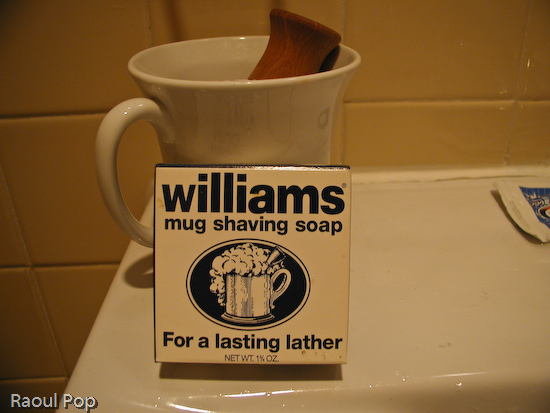 I use Williams Mug Shaving Soap. I tried the Colgate brand a while ago and it’s alright, too. Warm up the mug by running it under hot water, then moisten the soap and the brush with hot water as well. Rub the brush over the soap in a circular motion until you build up a good amount of foam. It should be solid foam that can stand on its own, not the soft bubbly type you get from regular soap when you wash your hands. If you’re going to use shaving lotions or gels, then I recommend picking one that’s gentle to the skin and has moisturizers. Avoid the lotions that make your skin tingle, they’ll irritate your face if it’s sensitive, and the shave may hurt more. I don’t have any specific recommendations, since I seldom use them. To shave, I use a Gillette Mach 3 razor. 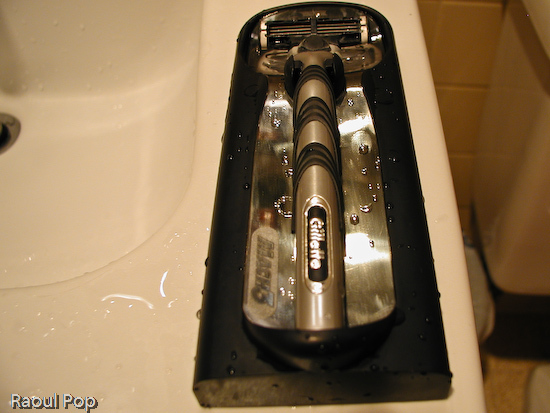 I realize Gillette will come out with newer models as time goes on, so don’t think you have to stick with this model. Find what works for you. Personally, I find the Mach 3 razor strikes a good balance between a close shave and a concern for those with sensitive skin. The only problem I’ve found is that if I don’t gently angle up the blades as I shave my moustache, it’ll leave some hairs at the base of my nose, so you may want to watch that if you use this product. I also find the single-blade razor useful for troubleshooting purposes. What I mean is that I use that once in a while to see where my shaving technique needs improvement. The areas where I cut myself or irritate my skin needlessly is where I’m probably not using correct technique. I’ll discuss shaving technique in just a bit. If you are experiencing a high level of irritation during your shaves, you might want to start working on your technique by using one of the BumpGuard razors. They’re marketed toward African-Americans, who are more prone to develop bumps from ingrown hairs, but they work great for those with general irritation as well. I actually keep a couple in my bathroom cabinet all the time, and use them once in a while to give my face a break from the Gillette razor. I don’t recommend the use of electric razors, although I’ve used them for years. They irritated my face, in particular the Norelco razors, which pull on the hair as they shave it. I suppose that works for some men, but for me, it was sheer pain. I used a waterproof single-foil Panasonic razor for some time, with okay results, and then I purchased a dual-foil Braun razor (fairly expensive). It gave me poorer shaving results than the Panasonic, which was half the price of the Braun. At any rate, I experienced varying levels of irritation no matter which electric razor I used, and my neck would tingle and feel painful to the touch all day long. Now, what about aftershave? I use something very simple: Witch Hazel. It works great for me, and I can get a large bottle for the same price as an after-shave lotion. It works great year-round, but I also use a moisturizer during the winter months, because my face gets dry. You may be in the same boat. 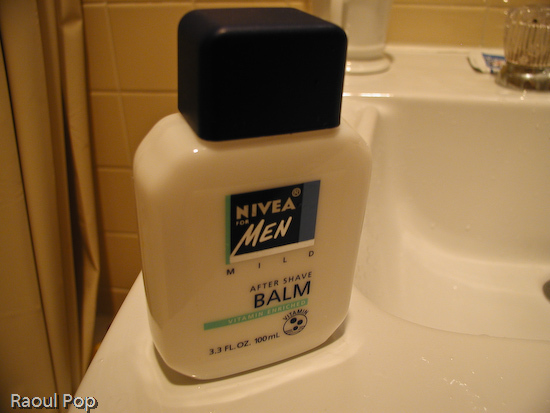 I also use the new (or fairly new, anyway) Nivea Men After Shave Balm. It’s pretty good. If you really want to moisturize your face though, I recommend the plain Nivea Creme (not pictured). It’s thick and harder to apply, but boy, does it moisturize! It virtually winter-proofs your face. Here’s where things get dicey, if not done right. 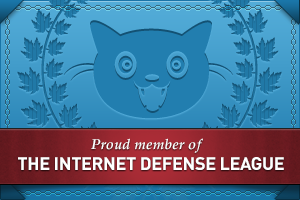 They talk about proof in the pudding… well, the proof is going to be on your face. It will show you if you’ve done things right or not. I really believe that! Let me give you a little background so you can see why. I thought I was incurably sensitive to shaving, and that I would always have to deal with serious irritation and even bleeding every single time I shaved. This wasn’t bleeding from cuts, although I had those once in a while, too. This was generalized bleeding at the site of irritation. Little drops of blood would start appearing on large areas of my neck or on the sides of my jaws, areas which were particularly sensitive. I struggled with this for years. I saw family doctors and dermatologists, and about the only advice I could get out of them was to shave less often (not much of an option when you’re trying to maintain a neat appearance) or to try the BumpGuard razors. The last bit was definitely good advice, and it started me down the right path. I went out and purchased some, and couldn’t believe the difference it made the first time I used them. I had no generalized bleeding, although I did have some little cuts, and significantly less irritation! The shave wasn’t as smooth, but the lack of bleeding more than made up for that. I realized I was onto something, and maybe there was hope for me. If you’re in the same boat, read on to see what I did. Moisten your facial hair with warm to hot water before shaving. Don’t just wet your face with warm water, take handfuls of water and splatter them on your face. Your stubble should be soft to the touch when it’s properly moistened. If it helps you do it right, use a facial towel that you’ve held under hot water. Keep that on your face and neck for about 30 seconds. Even better, take a shower and shave afterwards. Use a new blade, not an old, dull blade. If you’re using disposable razors, a cartridge will last you about a week for optimum cutting, give or take a few days, depending on your facial hair and technique. That’s not a lot of time, so have plenty of cartridges on hand. Rinse with cold water. Don’t use ice-cold water, but use room-temperature water, and rinse off the soap thoroughly. If you leave some traces of soap on the face, it’ll itch and irritate your face. Ice-cold water will dry your face, and it’s also an un-needed shock. Use a good after-shave. The key here is to use something. I used rubbing alcohol in the past, with good results. My grandfather uses that all the time, and his face looks great after shaving. 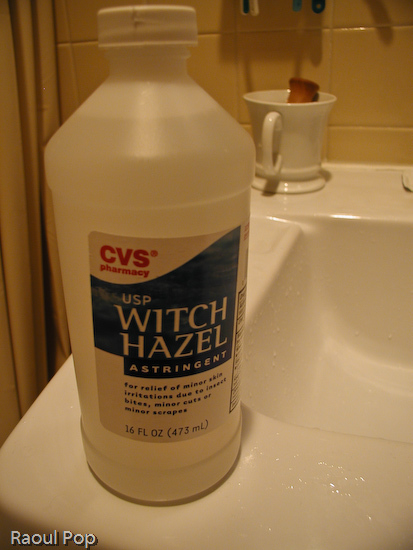 I now use witch hazel, it’s a little gentler than the rubbing alcohol. In cold seasons, use a moisturizing lotion as well. See section entitled “Shaving Utensils” above for more details on this. Apply the shaving lotion properly. Build a good amount of foam on your face. If you’re using soap, rub that brush in circular motions across your face until the foam is solid to the touch, like whipped cream. See the photo to the left for an example. Leave joking aside for a second and look at the way I’ve applied the soap. You want to make sure you’re properly covering your face. If you’re using a shaving lotion or gel, don’t assume that just because you’ve quickly applied it to your face you’re good to go. Really rub it on until the gel turns into solid foam. Even nowadays, I find that when I don’t build up the foam to a proper consistency, I’ll get irritated. Let the blade do the cutting. Don’t apply extra pressure with your hand. Apply only enough pressure to move the blade across your face, not more. If the blade is new and sharp enough, it’ll do the job just fine. If you get into the habit of applying more pressure, you will – I repeat, you will – irritate your face, and induce bleeding. I was guilty of this myself. Use small, fairly quick strokes, not large, long and slow ones. This is really important. It’s when you use the long strokes that you inadvertently cut your hair against the grain, or induce cuts in the skin, or shave off some skin beside the hair, causing irritation. If you use small, measured strokes, it works out just right. You don’t get irritated, and you can control the blade better. I know they always show these models on TV shaving the entire length of their neck with one stroke, but that’s only for show. It’s misleading. Don’t go by it! Trust me and use small, measured strokes. You’ll see the difference. Rinse the blade often so it’s clear of foam and hair. This may seem like a minor detail, but it will pay off. If the blade is clean, you don’t have to guess to know how close it is to the skin. You know how much pressure you need to apply. If there are hairs trapped between the blades, you will drag those hairs across your skin as you move the blade, increasing your chances for irritation. Replenish the foam by re-applying it in those areas where it’s dry or thinner. There’s no shame in re-applying foam to your face. You won’t fail Shaving 101 if you can’t finish shaving before the foam dries off, and it will dry off in just a few minutes. Don’t feel bad, it’s normal. Just wet the brush again, work up some foam, and re-apply. If you don’t, and you shave over thin or dry foam, you will certainly get irritation. It’s a given! Alright! 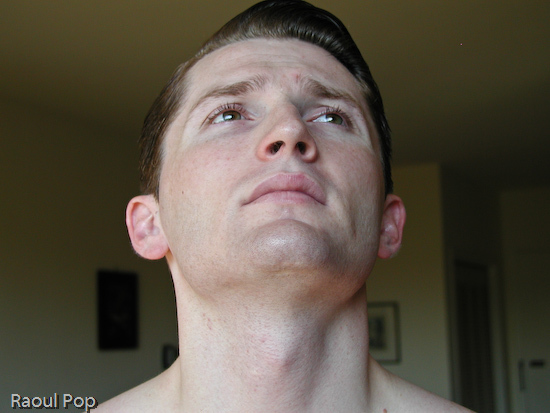 If you’re following these steps correctly, you should get a nice, clean shave, like the one pictured below. If you still have problems, you need to go back over the pieces of advice I’ve given you. If at any time you start experiencing irritation or bleeding while shaving, it’s very likely that your technique has deteriorated. You might want to give your face a break by using a BumpGuard razor for a few days, and it wouldn’t hurt to use a single-blade razor so you can pinpoint the zones where you’re not shaving properly. Wherever you get cuts and irritation, that’s where you’ve got to improve. I have been Wetshaving with DE razors now for 2.5 years. I personally like the williams soap. One thing I have to say is to stay away from Parker and Lords razors. I feel that if you are starting to shave with a DE razor, you should try either a Feather Popular DE razor or a Merkur HD razor. These razors are well made and are less likely to cut you than less well made razors. Thank you for the advice, David! I’m sure my readers will appreciate it. A very well written article, I enjoyed your video as well. I too suffered from terrible irritation and razor bumps but using a safety razor has cured it for me. Now shaving has become enjoyable.